Andrew Brandt famously said, “There will be lawyers.” This statement is true and could actually be quite an understatement when it comes the NFL’s Concussion Settlement. On the surface one might think an uncapped settlement that pays for 65 years would make for lots of happy attorneys, but the opposite has occurred; most of the lawyers representing the class and individual clients appear to be almost as frustrated as the players with the slow claims process, denied awards, frustrating rule changes and uncertainty of pay. On October 10, Co-Lead Class Counsel Christopher Seeger presented his proposal to the court recommending distribution of a $112.5 million common benefit fund with a whopping $70.4 million allocated to his own law firm. The proposal was based on widely criticized lodestar and multiplier formula in which firms submitted hours and expenses (lodestar) and Seeger equated value to them through via a multiplier ranging from .75, in which the firm would actually loose money to 3.885 for his own firm, which would if approved pay him 3.885 times his investment in the case. In his fee allocations, aside from the large entitlement he assigned to his own firm, those he hand picked to work with him received the next highest multipliers in the proposal. Four firms were given .75 percent allocations which placed them at a point of loss. One of the attorneys short changed was Brad Sohn, a young pace-setting attorney who is co-lead counsel for the opt-out plaintiffs. Sohn was recently procured by Baez Law as co-counsel in the loss of consortium lawsuit filed on behalf of Aaron Hernandez’s daughter, after Hernandez was revealed to have Stage Three CTE, following his suicide. Apparently the high profile firm Baez Law found merit with his work whereas Christopher Seeger oddly did not. While Sohn did not file an objection, apparently willing to cut his losses, it’s needless to say, numerous objections have been raised. Seeger has also proposed a 5 percent deduction from every approved claim for future benefit work, and this is currently being deducted from the few awards that have been approved thus far, although the Court has not yet ruled. Seeger appears to be the only party strongly in favor of this holdback; not only players and their families, but numerous law firms both inside and outside class counsel feel the deduction is burdensome and unnecessary. 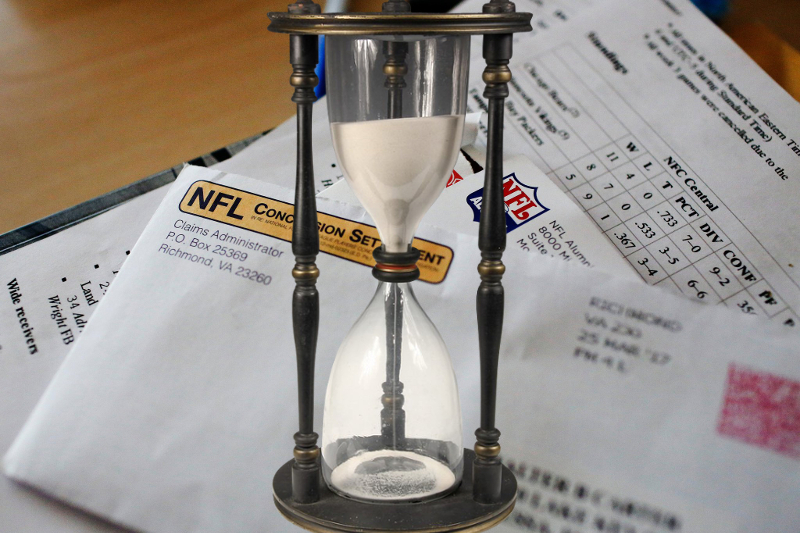 While the concussion litigation is about and should always remain focused on the players and their families who’ve been injured and left debilitated by the actions and inaction of the NFL, due to Seeger’s micromanagement, lawyers who once expected handsome paydays of their own continue to advocate for players as they too contemplate whether they will ever see a payday. After doing the research and deciding to pursue litigation, he sought the support of his firm to file the first lawsuit. The firm was interested but unwilling to assume the financial risk of such an undertaking. Through additional work he managed to secure two additional firms that would agree to work together and share the financial risk. Finally, in 2011 the first lawsuit, Maxwell vs. NFL was filed in Los Angeles County Superior Court. Along with the firms, Russomanno & Borrello and Girardi Keese, legal strategies were brainstormed and honed as the case was moved to federal court. As word of this lawsuit, and Pear vs. NFL which was also initiated by Luckasevic and colleagues, more and more lawsuits were filed, and as the origin of the litigation, became the basis for the MDL which resulted in the Concussion Settlement. In addition to Luckasevic, who in conjuntion with Girardi Keese and Russomanno & Borrello filed the first NFL brain injury law suit, Hagen, Rosskopf & Earle, Anapol Weiss, Kreindler & Kreindler, Pope McGlamry and Zimmerman Reed also filed early litigation against the NFL, dating back to 2011 as noted in their counter-declarations as well as Hausfeld who filed Brent Boyd vs. NFL in January 2012, in which Boyd, who testified before Congress about the dangers of brain injury in football and later founded the retired football player’s advocacy group, Dignity After Football was the lead plaintiff. At the time, Seeger had 13 individual clients in contrast to hundreds and in some instances, thousands of players and widows represented by the other firms that would later compose the MDL’s steering committee. The NFL is very much driven by public relations as can be substantiated in its very public reactive measures following the Ray Rice debacle. Nowhere has the NFL attempted to drive public perception more than in regard to head injuries and resulting brain trauma. Through the work of the attorneys in the Communications Committee as noted in numerous declarations, stories of how players suffer from the negligence and indifference of the NFL began to counter the NFL’s disinformation campaign. The work of legitimate neutral scientists such as Bennet Omalu and Ann McKee became known to the public along with reports of decades of NFL funded pseudo-science which produced reports favorable to the party paying the bill, discounting the dangers which placed players at grave risk. One NFL backed position even blamed the players’ wives for their symptoms of brain damage. Other firms felt the large number of players they brought to the litigation, creating a necessary critical mass, played a major role in convincing the NFL to settle. Seeger found this contribution insignificant as well. “[T]hese objecting counsel criticize me for not rewarding with higher multipliers that asserted risk and pressure their large inventories allegedly brought to bear,” he wrote, while discounting the risk involved in the early lawsuits while suffering little risk to himself, coming aboard with few clients prior to the formation of the MDL. 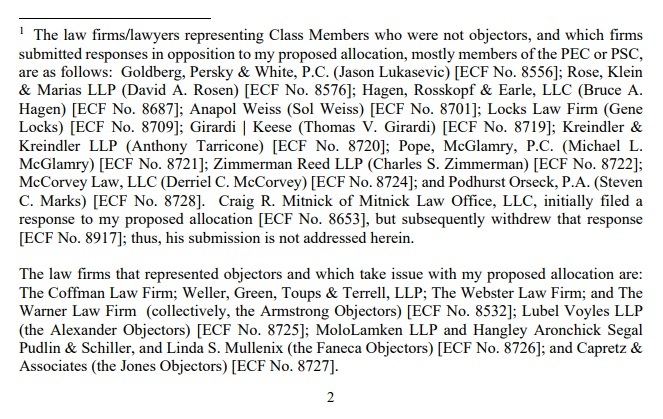 All in all, seventeen firms filed objections to Seeger’s fee proposal including the ones cited above. Seeger briefly addressed this motion in stating that the motion to prioritize “was not a genuine response to my allocation recommendations. Nor could it have been, because the attorneys who filed that submission performed no common benefit work.” While it is true that the law firms did not provide common benefit work, the movants made no allusion to having done so nor did they seek a piece of the common fund. They merely asked Co-Lead Class Counsel to refocus on the players to ensure their claims were fairly processed in a timely manner, suggesting that attorney fees could wait. Seeger did however address this motion in a separate filing in which he wrote, “The long-winded, ninety one-word title of this submission reflects its sanctimonious tone,” further stating the motion was “improper,” and that “implementation of the Settlement Agreement is now in full swing and monetary relief is regularly flowing to Class Members…” Since on record at the time of filing 140 out of 1400, or 10 percent of filed claims had been paid, apparently Mr. Seeger finds this low percentage acceptable as long as his fee petition moves forward. Recently Judge Brody, after a conference with Seeger, NFL Counsel and Special Masters appeared to acknowledge some of the problems plaguing the settlement. In a recorded message, followed by issuance of a notice, she promised greater transparency as well as measures to streamline the claims process. It’s noteworthy that in her notice Class Members are instructed to contact her court directly as opposed to in prior notices contacting Mr. Seeger. Will the Claims Administrator now be permitted to do his job without endless phone calls to Seeger and NFL attorneys to ensure that he’s implementing the settlement according to their wishes? Only time will tell. please see our NFL Concussion Settlement menu.